Standards of public health care are in free fall as fresh evidence now points at the acute shortage of sick-beds, especially in intensive care units, forcing doctors to discharge patients prematurely. A Daily Monitor investigation has found that there are only 37 intensive care unit beds in the country, with 12 in Mulago National Referral Hospital. The hospital beds (per 1,000 people) were last reported at 0.50 in 2010, according to a 2012 World Bank report. A doctor in Mulago who only agreed to speak off the record, said “discharge decisions are made with bed-capacity constraints in mind.” The doctor said the push to get patients out of the beds is based on the crucial need to save “those who are badly off” using the few resources available. Some patients with serious illnesses are left unattended to for weeks and access to drugs and feeding in public hospitals remains a challenge for many. Premier Amama Mbabazi told Parliament on Thursday that government is aware of the challenges in the health sector and blamed the crisis on a “limited resource envelope”. The country’s growing budget is now at Shs11.4 trillion but has yet to find a panacea for the overburdened public healthcare system. 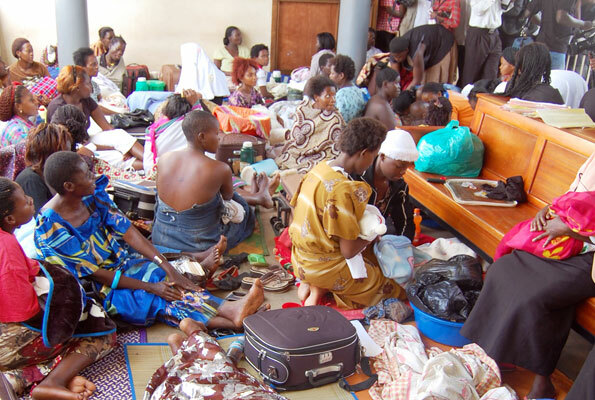 At public hospitals, the few doctors and nurses available are struggling to cope.Arua Regional Referral Hospital, which covers all West Nile districts and also DR Congo and Southern Sudan, has only 15 doctors, including the director, who is mostly doing administrative work. This means that the doctor to patient ratio is 1:178,600, while the recommended World Health Organisation ratio is 1:12,500. There were 56 vacancies at the hospital most of which were critical in service delivery. In Kabale Hospital, the situation is not different. The hospital on average admits 1,805 patients yet it had only 310 beds. One doctor attends to over 9,000 patients and one nurse supervises over 400 people. The hospital also lacks adequate space in the maternity ward, an accident and emergency unit and incinerator to safely dispose of bio-waste. The old sewage system and toilet facilities cannot match the ever increasing number of patients. Jinja hospital risks disconnection after it accumulated domestic arrears of Shs.454.1m in respect of water bills out of which Shs93.2m relate to 2010/11 financial year. While this situation severely undermines public health service dispensation, the management of Arua hospital said they had reported the matter to the Health ministry but no action has been taken to fill the vacant posts for doctors. The government has slapped a ban on recruitment of health workers citing financial constraints. This means that undermanned hospitals, can only recruit to replace those who have either resigned or died in the line of duty. The March 2012 report of the Auditor General calls for radical action to reorganise hospital care so that “Ugandans receive the care they deserve”. Three-quarters of doctors are under more pressure now than they were 10 years ago, and nurses report an unmanageable workload. Health Service Commission Chairman Pius Okong has warned of a “disaster” if government doesn’t lift the ban on recruitment. The Director General of Health Services, Dr Jane Aceng, puts medical staffing levels at 58 per cent. Dr Sam Lyomoki, the chairperson of Health Committee, has proposed that an additional Shs260b be allocated to the health sector to boost staffing level to at least 66 percent. Parliament heard last week that the hospital care was under intense pressure, leading to unnecessary indignity and distress. But government insists it needs more time to agree to the Shs39.2b the House Budget Committee found from cuts out of the Shs260b needed to fix the system.